Learn about the history of Joey’s Park and hear from Joey’s parents and friends in this short video created by Joey’s Park publicity committee chair Stephanie Leydon. Special thanks to Brian Sullivan Productions for help with videography and editing. 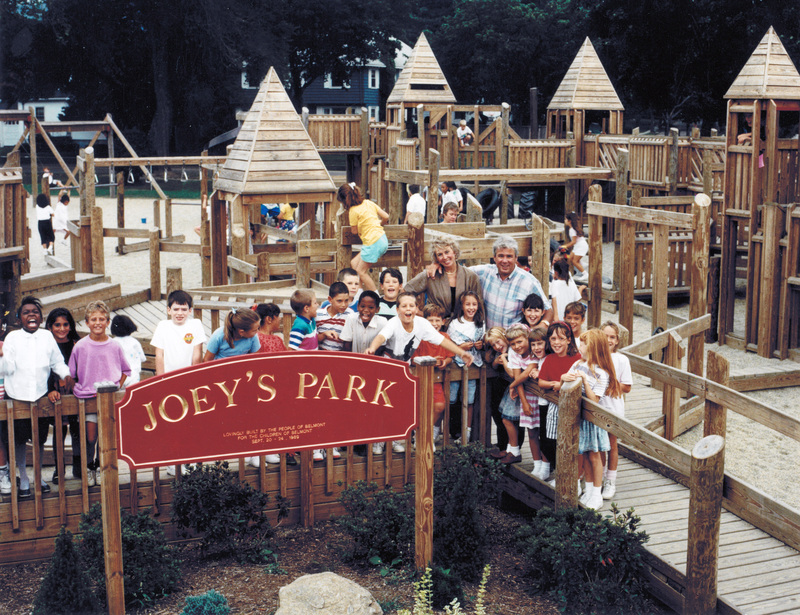 Joe and Kathy O’Donnell with students at the opening of Joey’s Park in 1989. Joey’s Park is a playground facing Cross Street in Belmont, Massachusetts, adjoining the Winn Brook Elementary School and Town of Belmont athletic fields. Built in 1989, it memorializes Joey O’Donnell, a former Winn Brook student who passed away in the fall of 1986 after a long battle with cystic fibrosis. The concept for Joey’s Park came from a group of his friends, then classmates at Chenery Middle School. Wanting to remember Joey’s fighting spirit, they organized a series of walk-a-thon and other efforts, culminating in a week-long “community build” project in September 1989. Joey’s Park captures young Joey’s fun-loving and open spirit. Designed by Leathers Associates of Ithaca, New York, the playground has invited children to come and explore for over two decades. 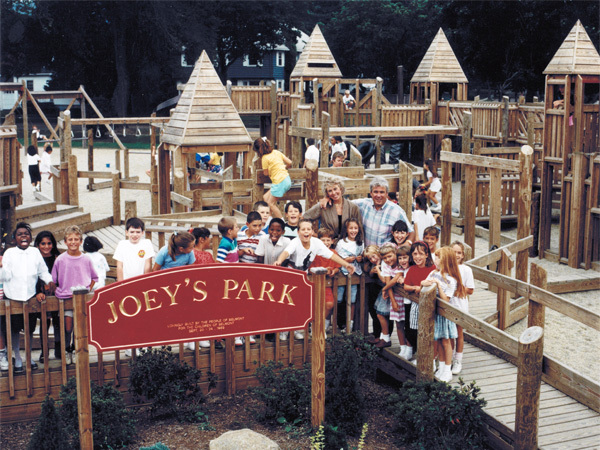 Many of us who grew up with Joey have now had the opportunity to play with our own children in the park. Today the equipment at Joey’s Park is quickly approaching the end of its useful life. A safety inspection in the fall of 2011 uncovered structural issues. Although the town was able to reopen the park after making some modifications, it is time to start thinking about what the park will be for the next generations of children. Friends of Joey’s Park is currently working on that vision, and we welcome you to join us. 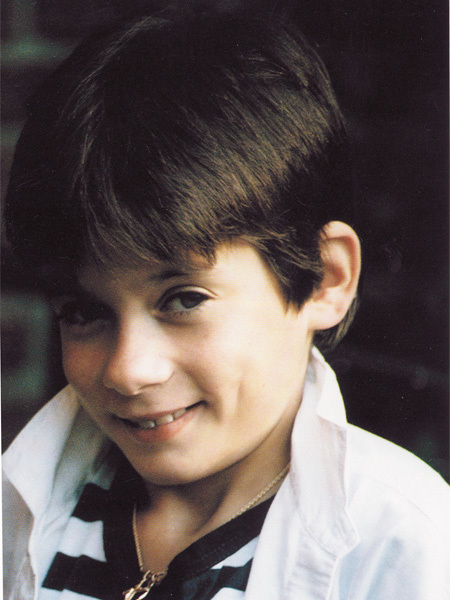 Joey was born the first son to parents Joe and Kathy O’Donnell on May 1, 1974 with a congenital lung disease known as cystic fibrosis. Cystic fibrosis causes secretions in the lungs which make breathing difficult and attract infection. Doctors did not expect Joey to live long, but he endured and fought for the next twelve years. During that time, Joey touched the lives of many people. Despite his personal illness, he maintained a positive outlook that was itself infectious. Although he struggled for breath, he played baseball and attended school, where it was not uncommon for friends to give him piggy-back rides from the bus up the steps. While Joey did not live long enough to raise a family or to pursue a career, his attitude inspired others to greatness. At his passing, his friends felt they had to do something, so they raised money, established a scholarship, and built a park in his name. His parents have been the driving force in organizing funding for medical research which has brought improvements to the lives of many afflicted by the same disease. Joey’s is a life worth remembering. His is a message for our children who play at the park, that the challenges of life need not limit us, for we can bring happiness and friendship to others. This is the spirit of community embodied in Joey’s Park. 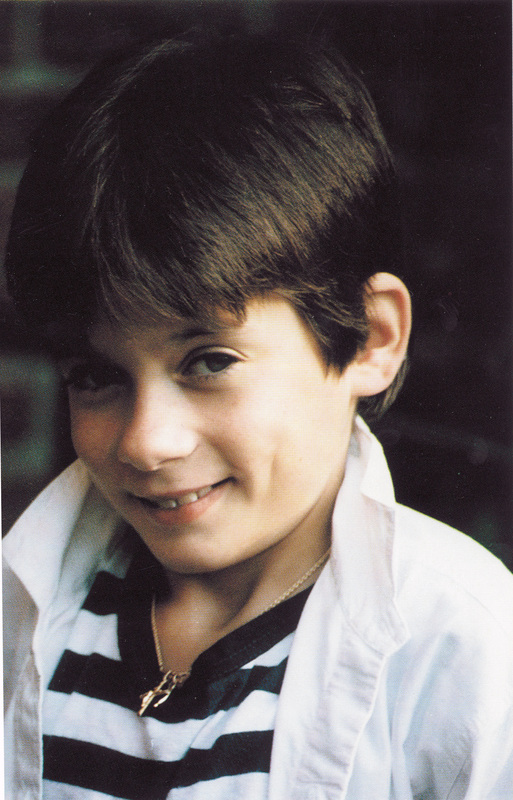 Click here to download a memorial booklet containing stories and photos from Joey’s life.